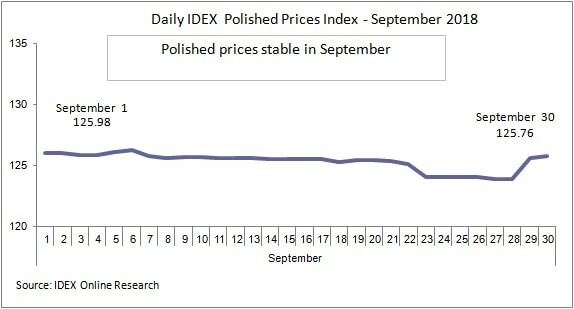 The IDEX polished diamond price index, published by IDEX Online, remained stable in September, “declining only very slightly”, according to the website. The Index began the month at 125.98 and ended at 125.76. 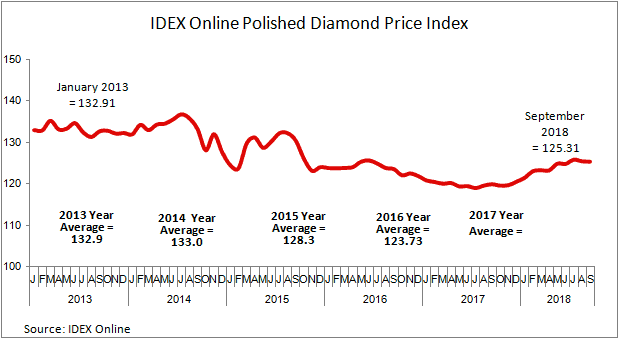 According to IDEX Online, since the last quarter of 2017 polished diamond prices have been on an upward trend. Last month, however, they experienced a slip. 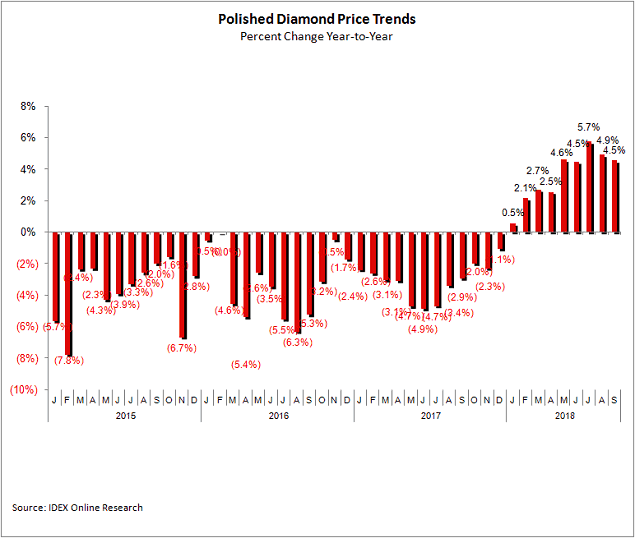 From January 2013 to date, there’s been a decline of 5.7% in polished diamond prices. 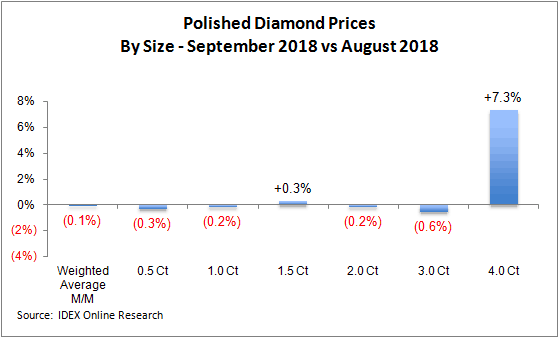 In September, polished diamond prices slipped 0.1% compared to August 2018. However, the average price year-on-year was 4.5% higher in September. When comparing prices during September over August, there were two rising categories and four declining categories. 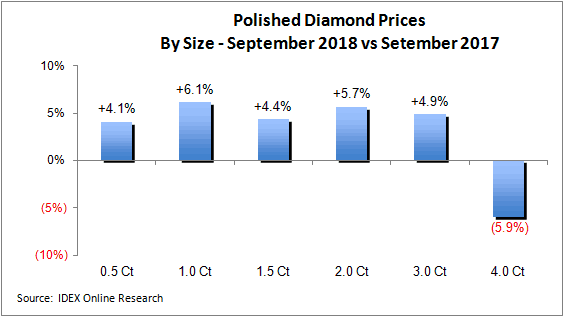 Year-over-year, five categories increased while 4-carat stones dropped. 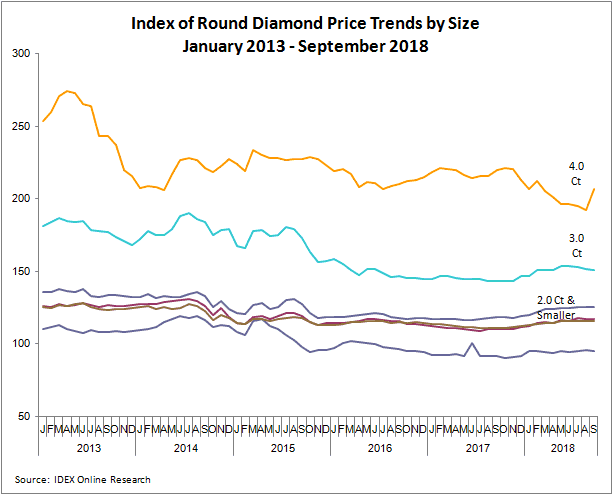 Since 2013, 4-carat stones “have shown the most price volatility – with a sharp rise last month – while diamonds of 2 carats and below have shown stability and rising prices since the start of 2017”. 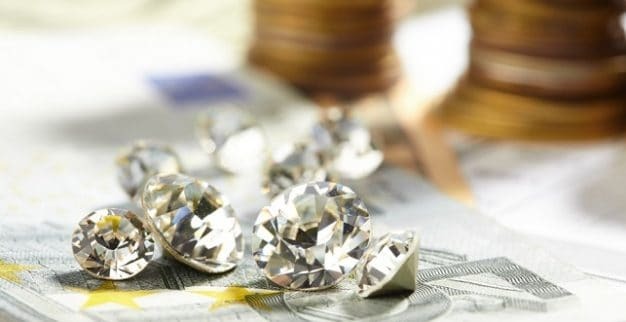 The one major event for diamond traders was the September edition of the Hong Kong Jewellery and Gem Fair. 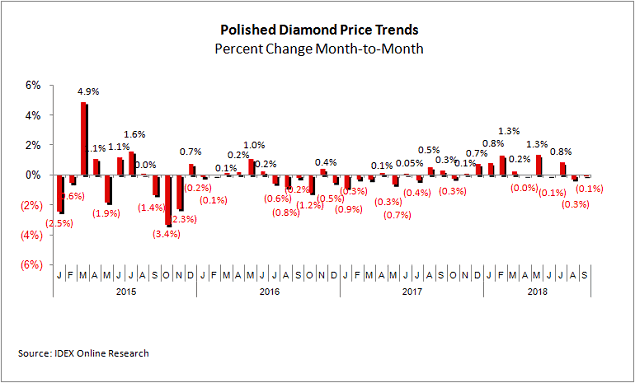 Due to Typhoon Mangkhut, which struck the area, “many diamond traders either didn’t make it or brought forward their departure dates”. In addition, the loose diamond part of the show at the Asia-Expo near Hong Kong’s international airport was ended a day early. The future looks brighter, though, as October marks the start of the holiday sales period, and according to IDEX Online, “retails sales in the US are expected to be strong – with a rise on the figures for 2017 – due to the strength of the American economy”.